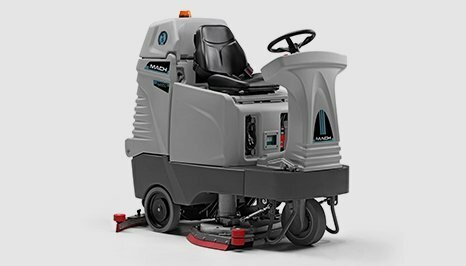 The M850 ECO is a heavy duty ride-on scrubber dryer ideal for the professional cleaning of areas up to 8.000 m². It has a cleaning path of 850 mm, and it’s equipped with a twin brush scrub deck which, combined to a 7.5 km/h speed, boasts an area coverage of 6.375 sq/m/h. Equipped with the exclusive ECO system, which allows enormous labour/water/detergent savings, and keeps you going up to 5 times longer on that one tank of water. Heavy duty chassis for extended lifetime and durability. Electronic traction, one pedal and fwd/rev speed selector. Traction motor vertically assembled for complete protection and excellent manoeuvrability. Brushes can be released and connected automatically, without tools. Water supply directly proportional to speed. Eco System, extend scrub time up to 5 times.